Located in small gated community of fine homes, this over 3,000 square foot home, with open floor plan, is great for entertaining or a perfect romantic get-a-way. Fully air conditioned with 4 bedrooms and 4 baths, large living room and a full kitchen. Most rooms offer beautiful ocean views. If you can’t tell from the picture, the only thing between the ocean and your home is 50’ of white sand beach. The full ocean view is made possible from the home by glass door walls that stretch the entire ocean side of the home. Enjoy the beach and ocean at your doorstep including snorkeling to your choice of 3 reefs. The Compass Point Resort is located a short 100 yard walk east at the end of your almost private expanse of beach. Area: West Bay Street, Love Beach, Nassau, Bahamas. If you’re trying to locate the home on a map it is immediately west of Compass Point and east of Old Fort Bay, minutes from the airport. Rental car is recommended as we are 10 minutes from Cable Beach and 20 minutes from downtown Nassau. Great home. Well kept. In gated community so very safe. Caretakers are delightful. Right on the beach, and it is private. Easy walk to nearby resort and also a cute beach bar a little further. Home is in good condition. Owner is responsive and helpful. This is a real private gem - uncrowded beach, beautiful water and amazing view as soon as you enter the house and never stops! We had 2 large families sharing this space and one small car. The bedrooms and bathrooms are big and the communal spaces are easy & casual. We spent more time outside than inside. We made quick & easy trips to grocery stores & airports, but mostly stayed put. Yes, the house could use some tlc ...sliding doors are sticky, screens need repair, quirky speaker system, etc - but these small problems could not out weigh the BIG positives, I wish I was still there! Needs updating but you will love the view! My family of eight adults rented this house in April and could not have asked for a better view and location to the water. Really, it is hard to beat. And thankfully, the location to the water is what saved our vacation. The house itself really tested our patience. We had hot water, dishwasher, oven and BBQ issues throughout the week. The owner started out very responsive to our problems but even he seemed to grow tired of his house. Everything in the house needs to be remodeled. Honestly, a remodel could bring double the rent just based upon the location. It's a reasonable and easy 20 minute drive into downtown Nassau, 7 minutes to the airport, 10 to the grocery store and 15 minutes to Stuart Cove (if you are diving). The water outside of the house is beautiful, although I do recommend water shoes to save your toes on the rock. If you snorkel out about a 1/4 mile, there is a little reef worth exploring. Compass Point Resort is a 3 minute walk away across the beach- easy to get to for a meal at their restaurant or a massage at the spa. I would not stay here again, despite the location. The furniture needs updating, the appliances struggle and unfortunately, the place left a bad taste in our mouth. The best things about this house are the beachfront location and the close proximity to the airport. 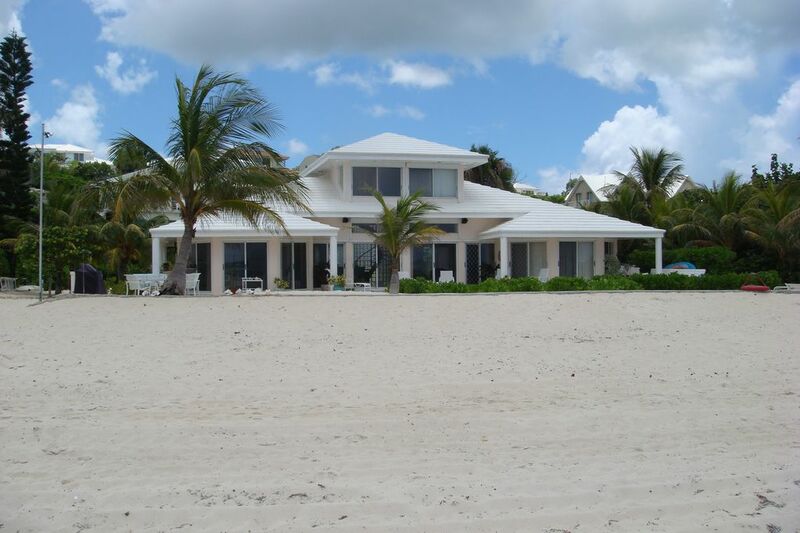 You are truly "one with the beach" at this house - beautiful views, and you couldn't be closer to the water. The jitney stop is close enough to walk (or take a car and leave it in the parking lot.) The house is in a gated neighborhood, so you feel nice and secure. The home itself has a great layout with private bedrooms and bathrooms, and a huge central living room. It definitely could use an updating overhaul, but if you're not bothered by that, this is a wonderful place to spend your vacation. This beachfront home was even more spectacular than we expected. The location was wonderfully uncrowded; remote, yet next door to the small Compass Point Resort where we could dine. It was spacious, clean, well maintained, with a fully stocked kitchen...in fact we cooked a delicious Thanksgiving dinner with no problems. With a rented car we were able to zip into downtown Nassau for shopping and Atlantis for the kids water park fun. The airport was a mere 10 minute drive. We hope to return to this delightful home in the future. It was great for the kids as well as grandparents with mobility issues. You walk right out the back door onto the beach front patio to sit and watch the kids play in the surf and sand. For pure relaxation and family-time, this was exactly what we were looking for.